Wisconsin Beer Geek: Brownie Porter - Horny Goat Brewing Co.
Like many of you, if you live in the Milwaukee area, I headed over to the Horny Goat Hideaway shortly after it opened in 2009. Back then I was somewhat impressed by the food, but less than impressed with the beer. At the time I thought it was just one in what has become a long list of mediocre craft breweries taking advantage of the recent public interest in craft beer. The beer wasn’t bad per say, just generic and it didn’t offer anything that justified picking up a 6-pack of Horny Goat beer in the store. When I spoke to someone associated with the brewery, he even admitted that when Horny Goat started, the focus wasn’t on the beer, but on the party atmosphere of the bar. From my early experience, that sounded about right. He was quick to reassure me however that the brewery now recognizes that it has to be about the beer, and to remain competitive in Milwaukee’s crowded craft beer market they have to release a consistently high end product. Part of the transition was promoting Brian Sauer to brewmaster in July of 2014. Brian, who has been with the company since 2011 was a home brewer for five years prior to his time as a brewmaster and like most homebrewers, the habit quickly became a big part of his life. When I contacted Brian about his employment at Horny Goat, he replied, “I’m fortunate to work for a company that believes in me and trusts me to help us get to the next level and I’ll die trying to help get us there.” Well Brian, I hope you do well with the brand! They likely also quickly realized they could not keep up with demand which led Horny Goat to move their large scale contract brewing operations out of Point Brewery in Stephens Point, WI to City Brewing (the old Latrobe Brewery) in Lacrosse, WI where they can brew each batch on a much larger system than was previously available. Larger batches mean that Horny Goat can brew less frequently and still produce a considerable amount of beer to meet their demand, much of which comes from outside the state. I wasn’t really sure what to expect when I picked up a can of Horny Goat, Brownie Porter, but I figured what the heck, why not give it a go. The malt bill of this brew is comprised of seven different malts for a very complex base. We add brown sugar to the boil which will increase the alcohol content and give the beer a molasses flavor. Cinnamon is then added to the whirlpool to finish. Finally, the beer is aged on Tahitian vanilla beans and Ecuadorian cacao nibs for a true brownie flavor. We work with a local chocolate maker in the city, Tabal Chocolate, to make the cacao nibs that go into this beer. Tabal is the only USDA certified organic chocolate maker in the state and one of a handful in the Midwest. I’m a huge fan of supporting local business in Milwaukee and feel it’s the lynch pin to our craft industries here. We use the best vanilla beans you can get – Tahitian! And throw in dark brown sugar for a rounded sweetness. This beer won a gold for us in the Great International Beer and Cider Competition back in 2013. Horny Goat Brownie Porter pours a very clear light mahogany with a thick, creamy, crème colored head with moderate rock breakup. The head holds very good retention, lasting 4-5 minutes before fading to become hazy with a thin collar around the edges of the glass that leaves a moderate amount of lacing behind. Mild chocolaty aromas waft out of the glass and bottle during the pour, and linger into the first sniff. Hints of earthy and slightly spicy cinnamon blend with the subtle chocolate, and a low level of vanilla add additional depth and complexity. Slight roasted malts and cocoa powder round out the aroma and linger into the finish. The aroma is interesting and complex, but doesn’t immediately pop out in my mind as a brownie-like aroma. A soft, delicate milk chocolate leads in the flavor backed up with slightly bready malts. Notes of vanilla, subtle molasses, and toffee blend well with an underlying earthy/spicy cinnamon that lingers through much of the glass. The finish is slightly roasty with some vanilla and a hint of chocolate. Moderately malty with a medium level of hop bitterness, I can’t help but feel that the bitterness is a bit too assertive to pull off the brownie flavor. Brownie Porter’s body is just on the light side of medium, and it has a moderate level of carbonation. Had the carbonation been tuned back a notch, I might have perceived the body to be a little fuller. When many people think porter they are expecting something darker and more stout like, but they always seem to forget that there is a lighter porter, the Brown Porter which isn’t quite as bold or brash as its big brother, the robust porter. Brown Porters are believed to be the original porter brewed in England way back in the day; the Robust Porter is a more American interpretation of the style. Yes, you read that right, we Americans weren’t quite happy with a brown porter and had to up the flavor quotient a bit. If you are reading this in the US, chances are that you are more familiar with a Robust Porter than the more traditional Brown Porter. It seems that Brownie Porter is more in the Brown Porter category with a lighter roasted malt character and more subdued chocolate flavors. The thing that sort of gets me with Brownie porter though is that right on the label it says that cocoa nibs were added. I love a good Chocolate stout and would have thought the cocoa nibs would be more prominent in the flavor given the lighter malts used in the brewing process. I did appreciate the cinnamon and vanilla additions however and thought they worked well with the beer as a whole. 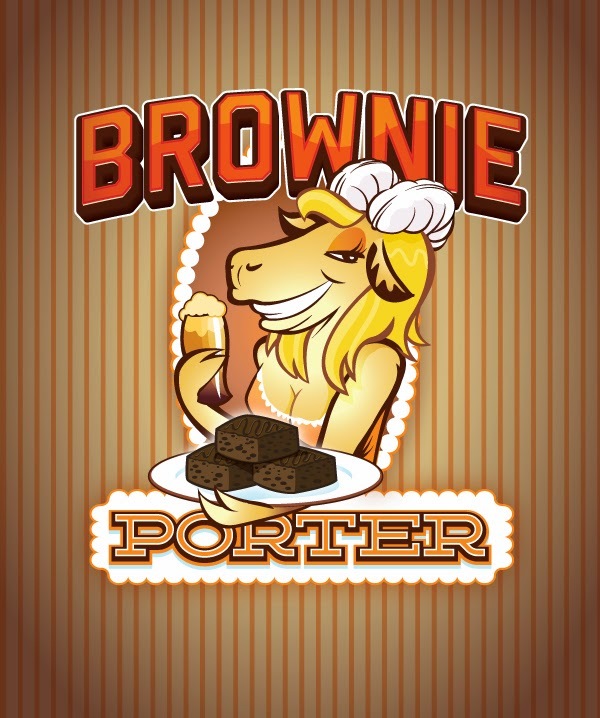 Brownie Porter is a good beer, it just does not remind me too terribly much of brownies as the label claims it should. Perhaps more time on the cocoa nibs could have accentuated the flavor.